Is to enrich lives of Pupils, People, Community, Society and beyond by integrating the Art of "Educational Puppetry" as a complement modular training program to the mainstream conventional academic training methodology, to impart Basic Language Skills, Elementary Mathematics and Social & Civic Sciences in collaboration with Women, Teachers and Educational Institutes. Fundamental to the vision, will strive to create an open platform to preserve, maintain and support the tradition of puppetry art by reaching out all the like-minded individuals, professionals, art lovers and amateurs. To inspire, inform, nurture, and empower learners, audiences, artists and the growing numbers of people of all ages and from many different communities who amalgamate with us to take part in our mission. 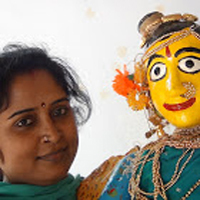 To earn the recognition and distinction as a "CENTER OF EXCELLENCE" for imparting Life Skills, Soft Skills, Communication Skills, Management Skills, and Moral & Cultural values by aesthetically re-presenting the Great Epics to folktales of Indian through this unique "Educational Puppetry" art. Sphoorthi Theatre for Educational Puppetry, Art & Craft STEPARC is constituted under the Society's Act 2001, Govt. of A.P., which comprises a President, Srinivasan Raghu A Post Graduate in Engineering. Presently working as an Director at a Leading Software Development Company at Hyderabad. Has a lot of enthusiasm and interest in the knowledge addition through Visual arts for the school-going children. Rainbow represents the colour and vibrancy that the organization aspires to bring about in the Educational domain through the medium of Puppetry. "Two Puppets a Girl and a Boy symbolize the unbiased approach towards Children and giving equal importance to both. Further it also symbolizes the Heritage of Music / Dance. Puppetry being a Visual medium has the ingredients of the rich Dance and Music as an art form. These inspire us to have Music and art as part of our life. Sphoorthi Theatre for Educational Puppetry, Art & Craft STEPARC is constituted under the Society's Act, Govt. of A.P., which comprises a President, Srinivasan Raghu A Post Graduate in Engineering. An Educational Puppeteer , Storyteller, Speaker, Presenter and Research Scholar. She holds an M.Phil in Sociology from Dr. B.R.Ambedkar Open University, Hyderabad, PG degree in Social Work, and a PG Diploma in Women’s Studies from Karnatak University, Dharwad, Karnataka. She is an Independent Research Scholar in Puppetry, Storytelling, Folklore, Sociology and Education. She is in the education and teaching field for over a decade. She was a Lecturer of Basic Chinese Mandarin and Spoken English at Vivekananda Institute of Languages, Ramakrishna Math, Hyderabad, from 2005–March 2010. I was a Resource Person for The Hindu-Newspaper in Education-NIE programme from 2003-2010.